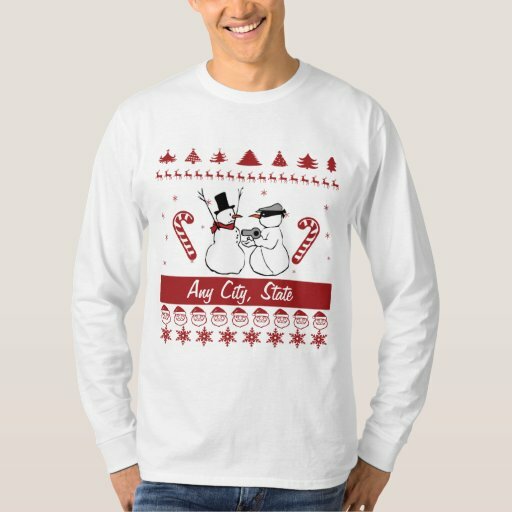 It’s that time of year again, and you and your friends want to put on an ugly sweater party in Cleveland Ohio for the holidays. To do that everyone has to come in their own version of an ugly Christmas sweater that has a Cleveland theme. It can be a sweater they they have made themselves, got from their favorite aunt or just bought yesterday. They just have to help you figure out how to have a Cleveland tacky sweater party, and participate by wearing one of these sweaters. To get you started, here are some NFL, NBA and MLB sweaters for Cleveland, with some how-to books and other helpful party supplies with a Cleveland theme. Have fun browsing for tips and party supplies to get your party started. These Cleveland Browns sweaters are a hoot-and-a-half. Tacky as can be, they are perfect for your party. Your friends will love voting on which one is the tackiest sweater. Some are unisex, and others are for men or women. In Cleveland, you can easily have an ugly sweater party with Cavs sweaters alone, just so that you can sport some LeBron James Cavs gear. Cavaliers colors are not as eye-blinding as the Browns ones when mixed together in a Christmas sweater. Here are some great choices for the NBA champions as well as some Cavaliers jackets and even a gnome. The Cleveland Indians made it to the World Series and all the way to game 7 in 2016, and right now there are no ugly Christmas sweaters for this team. You can buy World Series and MBA championship sweatshirts and t-shirts right now. Don’t wait, because they will run out. The first sweatshirt is really great, but my favorite is the Believeland t-shirt. 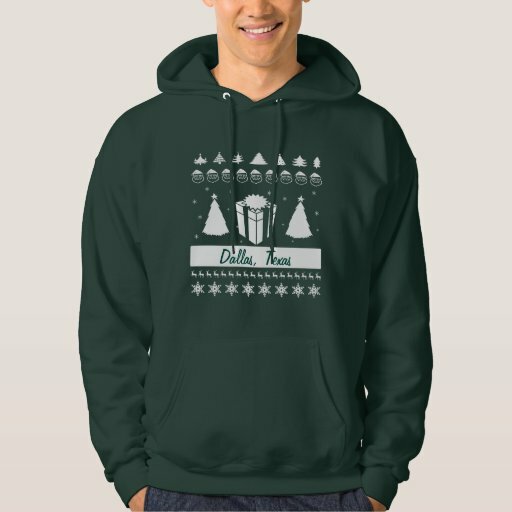 Cleveland State Vikings fans will love these holiday t-shirts and sweaters in the tacky Christmas style. With the great color scheme of green, white and black these look great on and can be worn just at the holidays or all year long. Look for kids sizes, too, when you click through to the product pages. 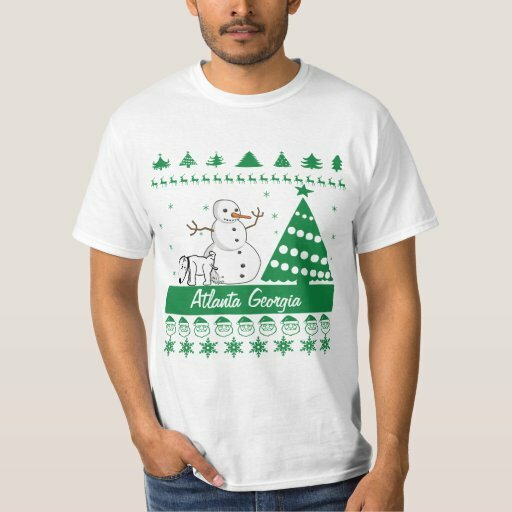 To keep warm this winter, you can add a hat or scarf in the ugly Christmas sweater tradition. The Cavaliers hat is pretty awesome, and it will keep your ears warm all winter long as you wait to get your seats at a game. When planning how to throw a tacky sweater party, you need to get some theme party supplies. 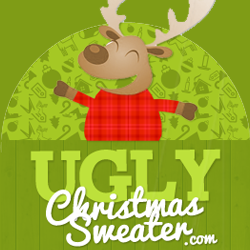 Below you can find some prizes and awards for the ugliest sweater. There are also tablecloths, napkins, beer kozies, balloons and more supplies to make sure you have the hoppingest sweater party in Clevetown. 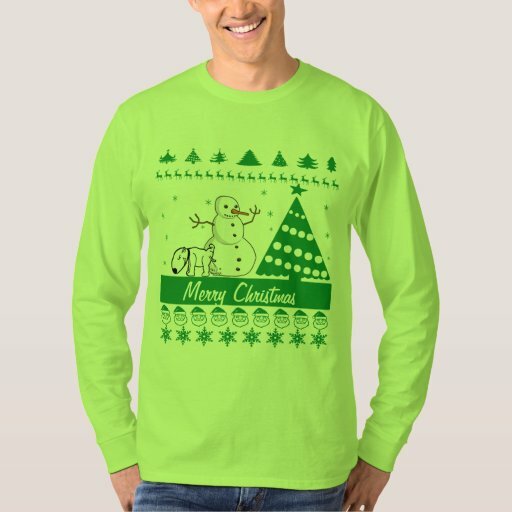 Everyone will have a great time decked out in their sweaters, and underneath they can don some personalized ugly sweater-themed t-shirts (see below). 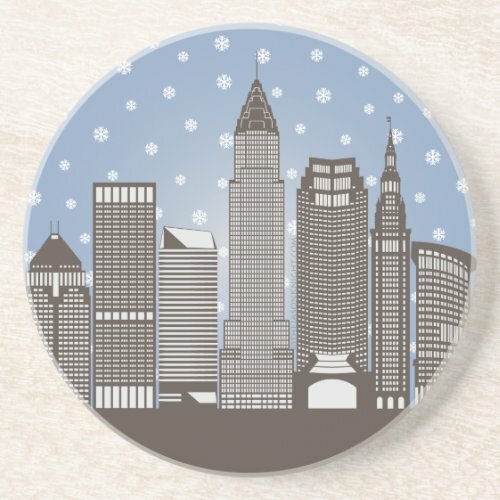 Click the buttons below for alternative sizes for napkins, plates and additional Cleveland supplies. 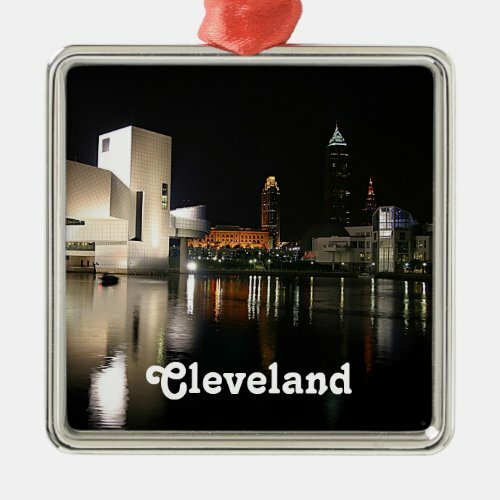 If you are not a sweater wearer, you can also come to the party in a personalized Cleveland Ohio t-shirt in a funny Christmas theme. 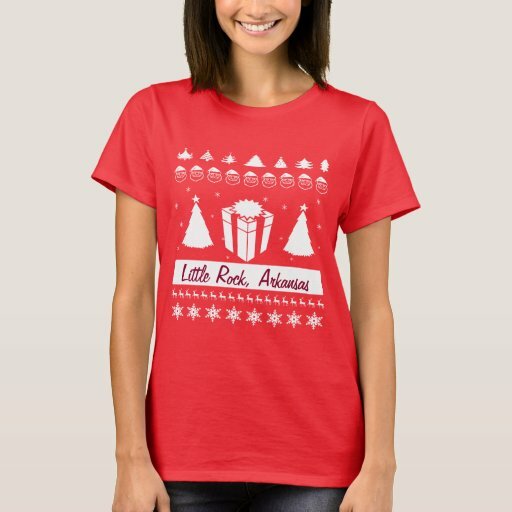 Each of these tees is available in several colors and t-shirt styles, and you can put the city name that you want as well as other personalized information. These are available for men, women and children in several styles. 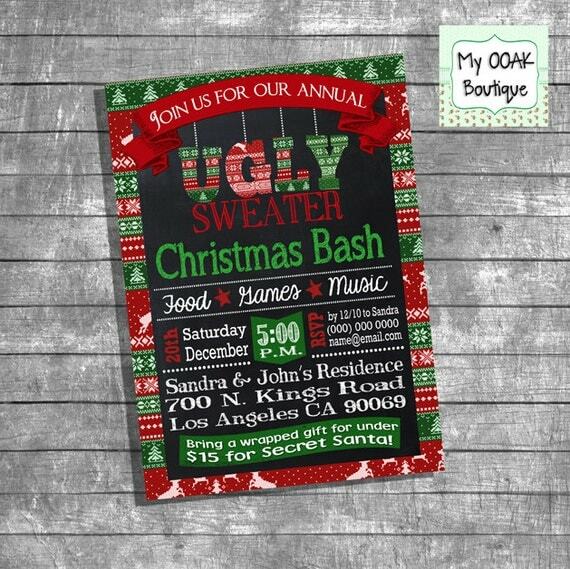 Comfy and warm, these are sure to get a laugh at the party, and they are certainly tacky! If you need more prizes or just a small gift for your friends before they leave, you can find many fun Cleveland novelty gifts such as these Ghoulardi stockings below. 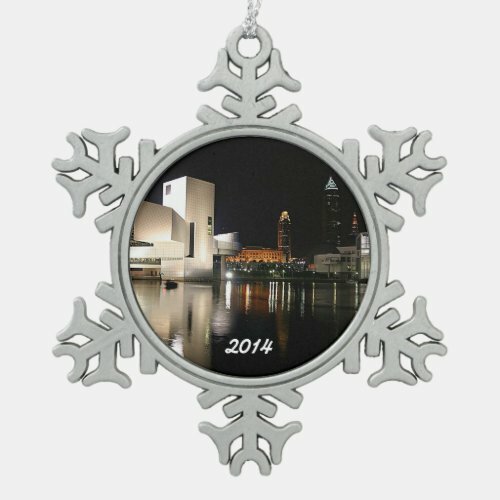 Most designs can be purchased on multiple items including the Rock and Roll Hall of Fame and Museum design shown on the ornaments. When you order, add your own name or the date to make each gift unique. And don’t forget invitations to your party. This set of invites can be personalized and ordered in any quantity for you to hand out or mail out to your friends and family. 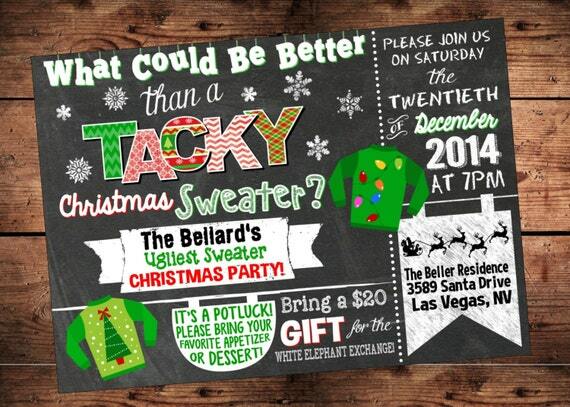 If you don’t like these, click through for many more sweater party invites that you can buy. 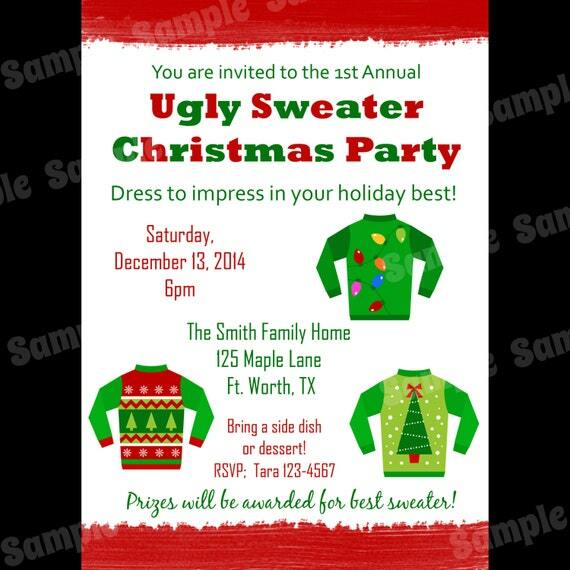 These invitations are pretty hilarious though. Good way to make your friends smile. 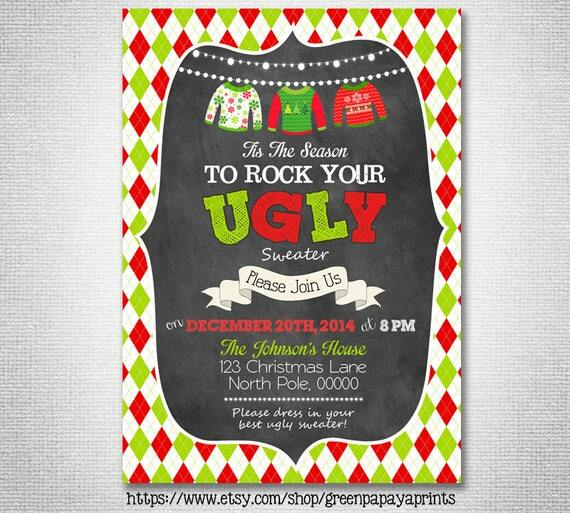 Or if you’d rather, save money by downloading and printing your own invitations. Each of these invites below ca be downloaded and printed after you personalized them with your own information. Adorable and colorful, they are sure to get your friends’ attention. Last but not least, is how-to information on having this party with games, activities and other suggestions to make the party more fun for everyone. 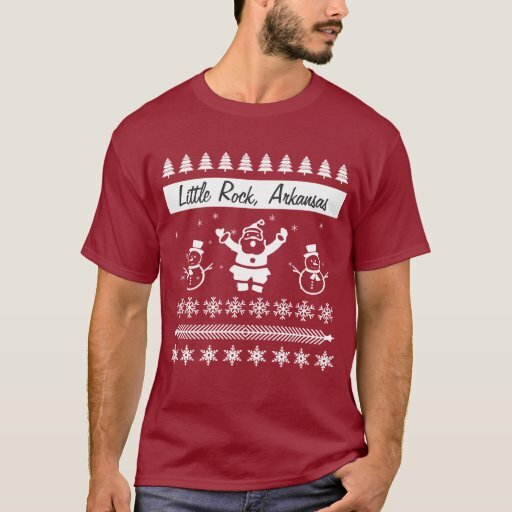 You can even learn how to knit your own ugly sweater. It is never too early to get started on your party planning. Browse through this page and the connected page for more ideas, inspiration and just plain fun. Let’s get the party started! Woot! You can use these ideas for a tailgating party too. Just wear your sweaters to the tailgate location before the big game. Show off your pride in your city and the team while getting ready to party at the game. 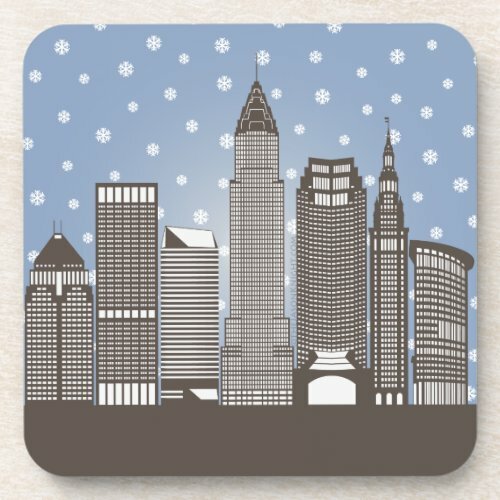 Get Cleveland Browns’ or Cavaliers’ plates and napkins. And don’t forget decorations for your car or truck! Love the orange sweaters for the Browns! Go Dawg Pound!